You cannot always skip Mirin or Sake but sometimes you can by using the ingredient(s) that can be a substitute (gives a shine and remove the unwanted smell of the ingredients). I personally don't like the gummy texture of the fat, so I removed the skin of the chicken. If you like it, you can keep it on!!! I like the chicken with skin when it comes to Karaage, though. I recommend chicken thigh because it is juicy. Chicken breast might be too lean, but it is up to you! 3. Meanwhile, cut the long onion diagonally into 2-inch-long pieces. 4. Heat cooking oil in a frying pan. Cook the long onion on medium for 2-3 minutes until slightly golden and crisp. Then set aside. 5. 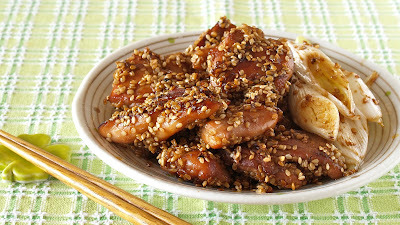 Drain the chicken well and coat with white sesame seeds (save the marinade). Then in the same frying pan, place the chicken, cover, and cook on medium for about 2 minutes. Open the lid and cook the other side for 2-3 minutes until done. *Please watch carefully, they can easily burn. 6. Remove the chicken from the pan, add the marinade, simmer, and stir until the sauce thickens. Add the long onion and coat them with the sauce. 7. Serve on a dish. It goes great with white rice and perfect for bento box!